Volunteering at your local animal shelter is a meaningful way to make a difference in the lives of homeless animals in your community. 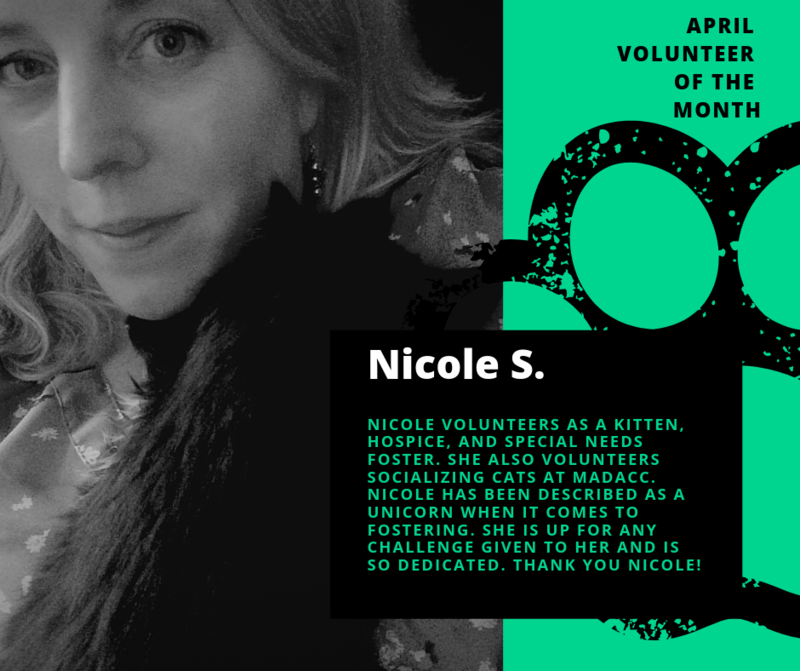 MADACC offers a wide variety of volunteer positions to help improve the lives of the over 10,000 animals per year that enter the shelter. MADACC asks that volunteers commit to a volunteer position and schedule for 6 months or more. This commitment is necessary because it takes time and resources to properly train volunteers. In addition, the animals in the shelter need you and depend on you! 1. Complete the Online Volunteer Application Form. Volunteers must be 18 years of age or older. 2. Attend a volunteer orientation session. Once your application has been accepted into our database, you will be invited to sign up for a New Volunteer Orientation. 3. Complete Tier 1 duties – laundry, dishes, and general cleaning – to become familiar with shelter operations. 4. Based on the needs of MADACC and your availability, train for a specific volunteer position. See below for potential volunteer opportunities. If you are a current volunteer or a new volunteer applicant looking to sign up for a “New Volunteer Orientation” please click below to access logins. Your login is your email and your password is the one you made on the application. Afraid of long-term commitment? We’ve got a solution for you! Milwaukee Area Domestic Animal Control Commission (MADACC) needs people to temporarily foster animals until they are ready for adoption. Your short-term commitment can make a difference in an animal’s life. Simply put, fosters change lives. Fosters put in the time and effort the shelter sometimes just isn’t able to due to the numbers of animals we have here. Sometimes all a foster needs to do is provide some love and patience and a second chance to a shy dog; other times it’s taking care of a litter of kittens to keep them healthy until they are old enough to be adopted into new families. There are many different options within fostering and many different levels of time and emotional commitment. We can’t control the number of animals coming into MADACC, but you can help us control the number that make it into loving homes. You can help us give these animals a chance. Our kitten foster program allows for two kinds of foster parents! There are traditional foster roles for those who wish to foster kittens and bring them back to MADACC for adoption. Then we have a new opportunity for those fosters who prefer to find new homes for their kittens on their own. We call these fosters “Adoptioneers”. Adoptioneers will be given all the necessary paperwork to facilitate adoptions right out of their homes after the adoption has been approved and paid for at MADACC (either with cash or via credit card over the phone). Email Anne Bucio at foster@madacc.org if you are interested in becoming part of our life-saving force!